Today everyone shares a huge concern about utilizing only what is natural. This holds true when it comes to remedies for teething children. That's why natural Amber Teething Necklace is at the top of the list for parents who are looking for pain relief and soothing support for their young ones. 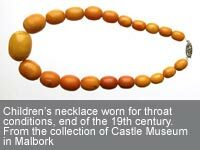 Easy and highly effective to use, Amber Teething Necklace has been used over thousands of years as a medicinal. Gentle and completely without side effects, Amber Teething Necklace is the choice of parents who truly embrace the Holistic aspect of child care. If you're in the market for an amazing find that will not only comfort your teething child but provide you some peace of mind, try a Amber Teething Necklace. Attractive to wear and designed to ensure the maximum success, it could be the answer for you. You must remember, however, that the key to the success of any Amber Healing Necklace is that it must be composed of genuine Baltic Amber. This is the Amber used throughout Europe and Asia for centuries and most notably documented as healing in 460 BC. And now that the trend toward natural healing is prevalent in the United States, there are "imitators" who sell products that in no way compare. Comprised of fossilized tree resin formed in ancient forests over 45 million years ago, genuine Baltic Amber is unique and irreplaceable. Baltic Amber contains from 3-8% of Succinic Acid, a scientifically examined medical substance used in contemporary medicine and this is what makes it so special. So when your child makes you aware of teething pain along with the accompanying irritability, fever and diarrhea, reach for natural Amber Teething Necklace. You'll be glad you did.